DUBUQUE, Iowa (AP) — Back when he was still just teasing a presidential run, Beto O'Rourke told Vanity Fair he was "born to be in" the race. Now that he's campaigning to far greater media attention and much larger crowds than many Democrats who've been competing longer, they are taking offense at the former Texas congressman's sense of entitlement. Minnesota Sen. Amy Klobuchar drew the sharpest such contrast on Sunday, saying "I wasn't born to run. But I am running" while acknowledging, "Oh, that's the Beto line." 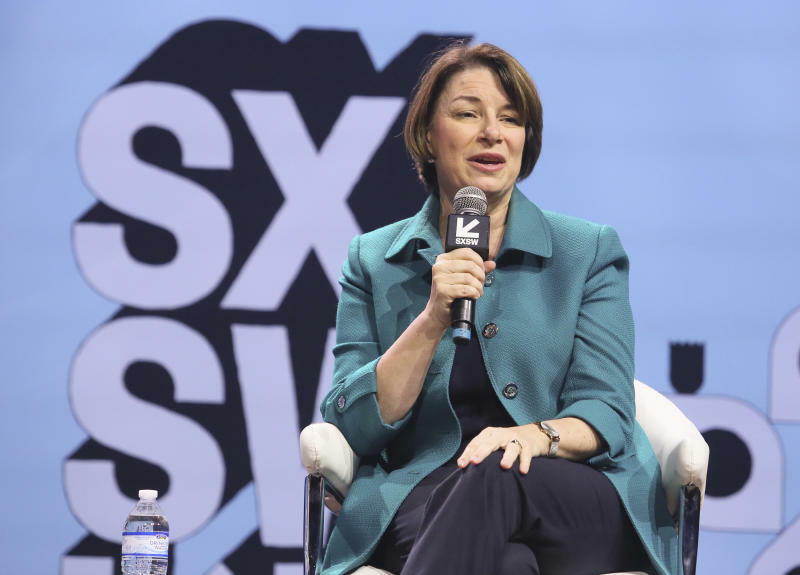 "No, I wasn't born to run for office, just because growing up in the '70s, in the middle of the country, I don't think many people thought a girl could be president," Klobuchar said on NBC's "Meet the Press." Asked about the same O'Rourke quote, Mayor Pete Buttigieg of South Bend, Indiana, was gentler, saying "I think I was born to make myself useful." "I'm not combating anybody," he told "Fox News Sunday." ''They are going to be competitors more than opponents, I think, among the Democrats." Still, other Democrats have taken more veiled swipes. Former Obama administration housing chief Julian Castro, who hails from San Antonio, has pointed to references that he's the "other Texan" in the White House race and says that though he's not the front-runner now, he will eventually overtake better known candidates like O'Rourke. When asked about the Vanity Fair quote, New Jersey Sen. Cory Booker said that he's dedicated his professional life to working with "communities that are really being left out and left behind." New York Sen. Kirsten Gillibrand said she'd be more willing to fight hard for Democratic values then promote the kind of feelgood, bipartisan optimism that O'Rourke favors. Such intraparty fighting is uncommon with the election still about 18 months away and marks a contrast to how nice — or at least not openly antagonistic — the crowded field of Democrats running was to one another before O'Rourke's announcement. 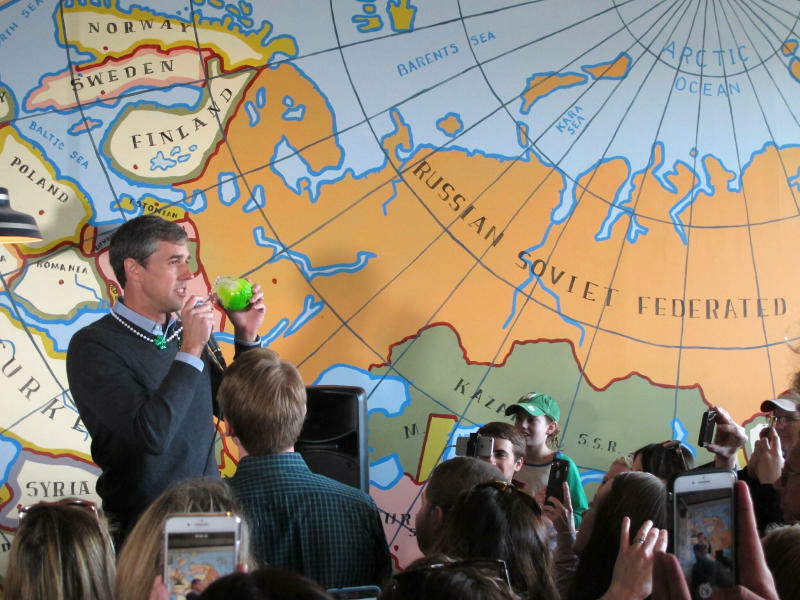 Speaking to reporters in Milwaukee on Sunday, O'Rourke tried to clarify the Vanity Fair quote, saying when he saw the story, he thought, "'Man, I hope I didn't say that.'" "I think the context of that, which makes sense and is the way that I feel, is that I'm born to serve. I'm born to try to help bring people together," he said, later adding: "I don't know that anyone is born for an office or a position and I certainly am not. But I do think that I find my purpose and function in life in doing this kind of work." O'Rourke spent months hinting that he was running for president before finally announcing last week. He immediately drew overflow crowds at stops across Iowa, which kicks off presidential primary voting, but then was driving a Dodge Caravan to the battleground midwestern states of Wisconsin, Michigan and Ohio — hoping to indicate that, beyond the primary, he can be a strong Democrat and win places where Hillary Clinton lost to Donald Trump in 2016. On Saturday, O'Rourke acknowledged benefiting from years of inherent white-male privilege. But those comments came when he was asked about whether his party would nominate another white guy for president in a year when a record number of women and minorities are running. He also said it would be his preference to pick a female running mate — but noted that he has to win the primary first. 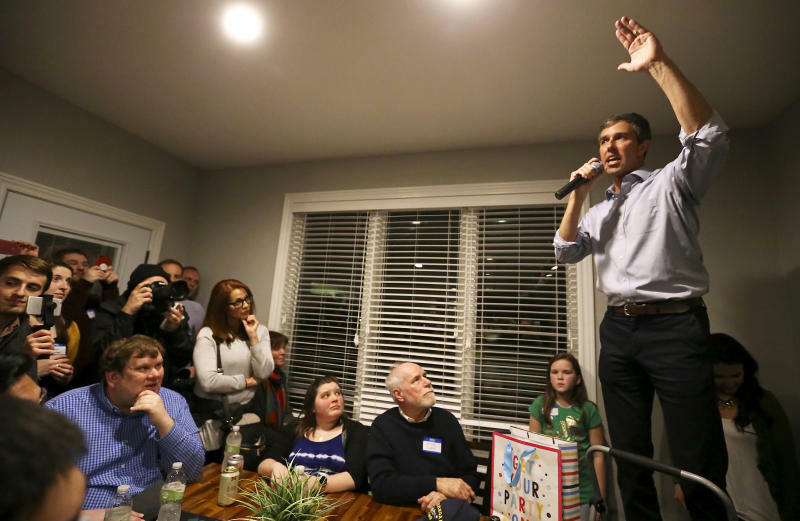 O'Rourke vows not to attack his fellow Democrats, telling a packed, weekend house party in Dubuque that "the diversity, experience and skills and expertise and perspective that" so many candidates running bring to the presidential race "is to the benefit of all of us." "You will not see us demeaning any of the other candidates, ever uttering a personal word about anyone else," he said. But O'Rourke has made similar promises to keep things positive in the past — only to renege. For more than a year, he refused to go negative against Republican incumbent Ted Cruz during his star-making, near-upset in November's Texas Senate race — only to reverse himself and refer to President Donald Trump's 2016 Republican presidential primary campaign nickname for Cruz, "Lyin' Ted," during a debate mere weeks before the election. O'Rourke subsequently sharpened criticism of Cruz to narrow gaps in the polls and wound up losing by 215,000 votes out of nearly 8.4 million cast. As a presidential candidate, O'Rourke has also repeatedly praised a prospective White House hopeful who still hasn't entered the race, Vice President Joe Biden, saying "I think he has a lot of perspective and experience to bring to bear." That could be an effort to defuse coming criticism of O'Rourke himself because he didn't accomplish much during his six years in the House. But not all would-be voters see that as a bad thing. "He doesn't have any votes to renounce or flip flops," said Nick Fisch, a 25-year-old teacher who attended the Dubuque house party. Then, recalling another relatively inexperienced Democratic presidential candidate who did well in Iowa, Fisch added: "It's the same thing (Barack) Obama had."